Welcome to the Water Front, Private Water Access Home that Accommodates your Lifestyle. Timeless Elegance & Southern Charm situated on ¾ of a prime Crystal Coast acre. Every room in this one story Country Club Point home is clean, comfortable, and spacious. Interior features include 4 Bedrooms, 3 Bathrooms, Florida room, screened in porch, hardwood flooring, granite countertops, stainless steel appliances, and soft, inviting paint colors. The 4th bedroom is a brand new addition with bath and porch, just right for an in-law suite. Outdoor features include impeccable Carolina landscaping with palm trees, new deck, newer roof, circular driveway, carport, seawall, a 10,000 lb boatlift, jetski boatlift additional boatlift and a dock situated on deep water with covered sitting area for the prettiest views of Bogue Sound. We are excited to show you around this remarkable home and neighborhood, call us today to schedule !! 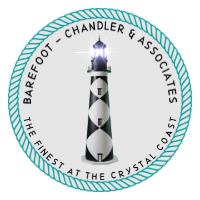 Barefoot-Chandler & Associates is a privately owned boutique real estate agency at The Crystal Coast. We respect your privacy and we do not share or spam your contact information.